In 1995, Garfield experienced a shooting within its walls. Ms. Fortune was a sophomore when the shooting, which left two people injured, occurred. The concern in Miss. Fortune’s voice as she recalled this day at school hits close to home for many students attending Garfield today, as a threat of gun violence was made recently. Gun violence in schools has been a major issue since the first highly publicized school shooting at Columbine High School in Colorado. This horrifying trend was once again brought to national attention after 17 students were killed in Parkland, Florida on February 14. 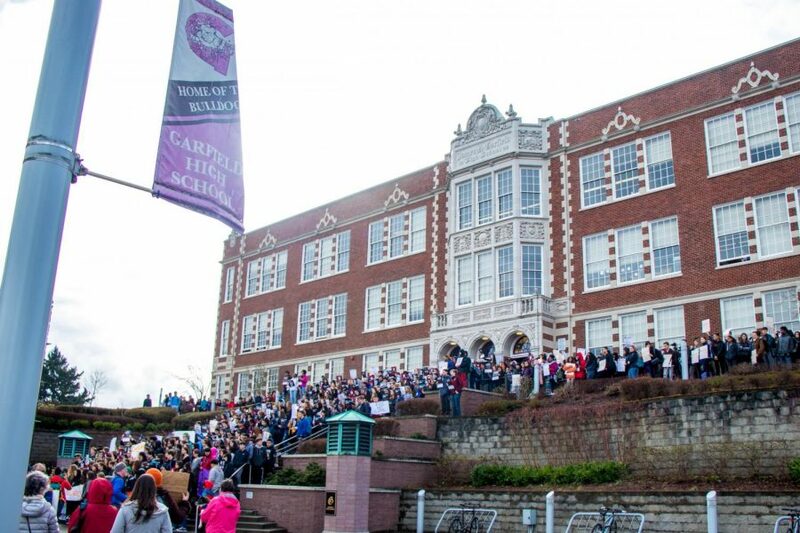 Six days later, at the start of mid-winter break, members of the Garfield community received an email stating that threats of a school shooting had been made by a student. In light of this event, both GHS students and parents were invited to a safety and security meeting on Thursday, March 8th. Those who attended were able to submit questions to a panel that included individuals from the District Security Office, Seattle Police Department and Garfield Ad- ministration. Garfield Principal Ted Howard started off by addressing the recent threat. He informed parents that the student was not currently attending Garfield, and it was unclear if the student would be returning. He also expressed his gratitude that other students had voiced their concerns regarding a threatening photo posted on the student’s social media and other alarming comments that students had overheard in class. “If you see something, say something…I’d rather have someone tell me something that is…not true than…to not say anything at all.” Howard said. He acknowledged the conversations many classes were having concerning the incident. “We need some more training on how to have these conversations,” said Howard. Howard also discussed the school’s plan, which is still in its early stages, to train faculty, and later students, on how to recognize warning signs. He mentioned that Garfield would be working with an outside organization and that the school would be prepared to provide an 8-module institutional emergency and awareness course. This would include evacuation planning, identifying threats and suspicious persons, verbal descalation training, responding to hostile persons, and active shooting training. This resource is relatively new, being instated this year as requested by students. “We really want to make sure that students are feeling safe to be able to report,” said Pegi McEvoy, the Assistant Superintendent of Operations for Seattle Public Schools, during the meeting. She mentioned that all reports on incidents are confidential so students shouldn’t have a fear of retaliation from suspects. She also named another resource, called the Safe Schools helpline, which is a way for students to report threats, bullying and any other negative issues anonymously by calling and texting through an app. Within the past few weeks, there have already been some notable immediate changes within the building to prevent such events from occurring.. The East and West side doors will now be locked and the Alder doors are now emergency- only exits, in order to direct traffic through the front of the school. “That way we can see who is coming through our building and we know who is coming in,” Howard said, referring to the new changes. Additionally, Mr. Howard is encouraging faculty to stand in the hallways and classroom doors will be locked immediately after passing period is over. Some parents and students brought up that closed doors inhibit a welcoming environment, but the decision was made by administration in the interest of safety. “If the doors are already locked, if something happens, then [the teachers] don’t have to walk to lock the door,” Howard said. One parent at the meeting voiced concern regarding the security of the portables, a new addition to the school. “[Around] our gymnasium as well as our portables…we have a bigger presence of outside security, walking the perimeter,” Mr. Howard said. Another question touched on the topic of open-air class- rooms, which have only partial walls, and if students should enter the hallway and move to another classroom in the event of a lock-down. Originally, these rooms were mean to be an additional part of the hallway, but they were convert- ed into classrooms to accommodate student population. Mr. Howard finished up the meeting, encouraging students to speak up about their concerns. “We don’t have the answers, so if you know of something and if somethings popped up in your mind that you want to give us feedback on, please do so. Gloria Fortune is now sending her own kids to school at Garfield.